Choose to view by Congressional District, State Senatorial District, House District or Jurisdiction. Select your district on the map. 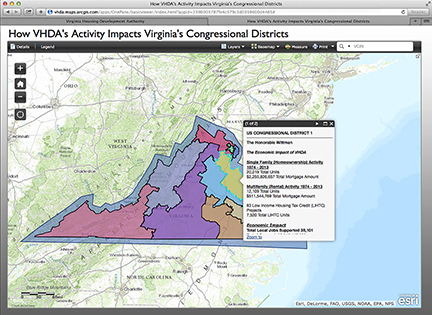 You'll be able to view details about the impact VHDA is having on single-family home sales, multifamily development, jobs creation and other data specific to your district. Questions? Contact VHDA's Government Relations Manager at 804-343-5620 or email Richard.Taylor@vhda.com.